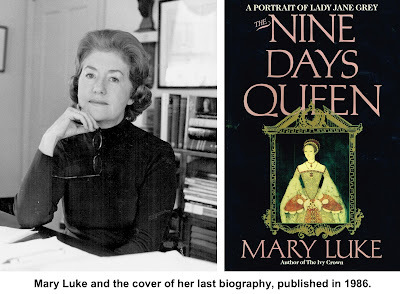 A long-ago world of Tudor and Elizabethan royalty fascinated Mary Luke, a meticulous and critically acclaimed novelist and biographer whose specialty was the wives and children of Henry VIII. From her first book, “Catherine the Queen,” through her last published work, “The Nine Days Queen: A Portrait of Lady Jane Grey,” she set about chronicling the often complex relationships of royal characters of the 16th and 17th Centuries. Born Mary Munger in 1925 in Pittsfield, Mass., Luke graduated from business school and worked in advertising, for a documentary film company and for RKO Studios in Hollywood before finding herself as a writer. Between 1967 and 1986, she wrote seven books on Elizabethan and Tudor royalty, all well received by The New York Times and other reviewers. Luke researched her subjects thoroughly, visiting the places where the characters lived, reading their letters and journals, and viewing sites where dramatic episodes in her books took place. A Ridgefielder for nearly 40 years, Luke lived on Hawthorne Hill Road and was active in the community. She was president of the Ridgefield Library and a longtime board member. She also worked for the District Nursing Association (now Visiting Nurse Association), and the Thrift Shop, and was active in the conservation efforts of both the Ridgefield and Caudatowa Garden Clubs. A prolific letter-writer, she often penned comments on Ridgefield affairs in the letters column of The Ridgefield Press. She supported some officials and criticized others, backed some proposals and opposed others, all with an eye toward improving the cultural or environmental quality of the town. She died in 1993 at the age of 74.